An “internal use only” photo of the upcoming 2010 Toyota Prado, better known to North Americans as the Lexus GX, has been leaked online by Vince Burlapp. The present day Toyota Land Cruiser Prado has been around for the better part of a 7 years and, as popular as it may be, a redesign has definately been in order. The curved body contours are acceptable (maybe too bloated) but the overall lack of quality design risks upsetting many diehard Prado fans. Whether you like it or not, what you see is most likely what Toyota plans on launching in the next few months. lookin pimp, much better than previous model! to me it looks like the Chinese copy here. i think it looks too much like a wannabe cruiser from the side,.. but then again, pretty much the only people who buy prados are the ones who WANT to buy a cruiser but can't. Looks hideous from the front, but like the new landcruiser it will grow on us, If the new one looks like this. It looks like the new landcruiser a bit, I think everybodys doing it now, just like the corrola is baby camry, this one sort of looks like a young landcruiser. to hell with the wannabe/social climbers/vaderas/chiochoras favorite car (prado), i want to know what the new surf will look like??? Exactly! Me too personally like Surf over Prado. I don't know but to me Prado seems to be the first choice of 2 number people here. Wow; After looking at 09 prado & 09 LC...I can easily draw a Surf for you Sameer saab & I can even bet that, thats how its going to be sirjee !! prado aint ugly "AS ALWAYS" ..........there r many previous decent models of it!! no matter that this new model is not attractive......at least better design than crv. 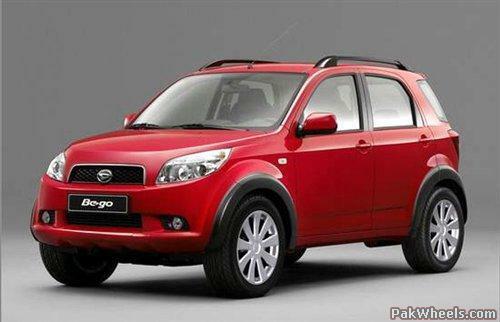 The most cheap variant of prado will cost atleast 35 lacs. While a Cruiser 98-2000 can be bought in this price easily. And those going for 4.0L Prado can easily buy a Cygnus. those of u who says its a wanna be land cruiser... cmon which part of this PRADO do u think looks like a landcruiser... from every aspect if u look at it ... the new design is quite an impressive successor to the old prado.. and hey cmon enough... those who says prado is not tough and rough.. cmon PRADO is very tough in its category dude... cmon u ever compared it u will know...anyways i dont care if a door handle or a singlecurve is like land cruiser cx if we come to history .. PRADO is indeed a son of land cruiser ... thats why its called landcrusier prado..
@storm .... TOYOTA's SUV's r the toughest my frnd..
Toyota in recent years is coming up with quite stupid designs, I must say. They are ruining the legacy of their proven great machines. those of u who says its a wanna be land cruiser... cmon which part of this PRADO do u think looks like a landcruiser... from every aspect if u look at it ... the new design is quite an impressive successor to the old prado.. and hey cmon enough... those who says prado is not tough and rough.. cmon PRADO is very tough in its category dude... cmon u ever compared it u will know...anyways i dont care if a door handle or a singlecurve is like land cruiser cx if we come to history .. PRADO is indeed a son of land cruiser ... thats why its called landcrusier prado.. @storm .... TOYOTA's SUV's r the toughest my frnd..
the current prado shares more with the hilux/vigo than it does with the cruiser. infact the fortuner, hilux/vigo, surf and prado ALL have the same platform. toyota just wants to bridge the gap between the cruiser and the prado and that is why it originally gave the old prado the name "land cruiser II". BTW I love toyota trucks, we have 3 in the family. but unless they are modified for offroad use ALL of the new toyota SUVs are softroaders (more street oriented).